This easy-to-read Disney Belle children's watch will have little one's enthusiastic about learning to tell the time with inspiration from the Disney classic Beauty and the Beast. With a hard-wearing, durable yellow rubber strap and a gorgeous yellow bezel with the minute numbers clearly displayed, this watch is suitable for even the most active of kids. The hour and minute hands are clearly displayed on the dial that features one of the most iconic characters in Disney history, the Beauty and the Beast princess, Belle. 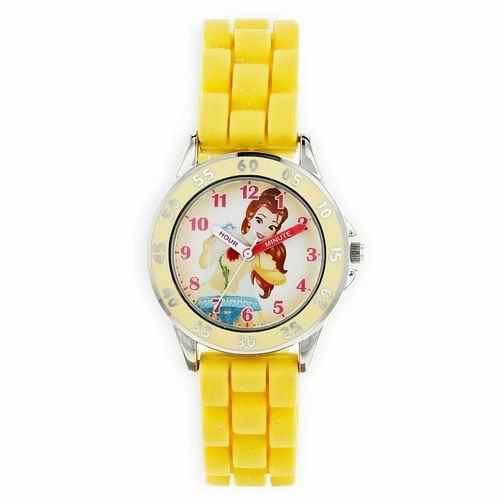 Disney Belle Children's Yellow Rubber Strap Watch is rated 5.0 out of 5 by 2. Rated 5 out of 5 by Anonymous from Disney watch Brought this watch for my 5 year old daughter, she was over the moon with it.